While we are all familiar with the many popular woodworking shows that have had long runs on public television (The Woodright’s Shop with Roy Underhill, New Yankee Workshop with Norm Abram, and This Old House, among others), there are a few that have gone less recognized. One of these was Woodworking Together, hosted by Gail O’Rourke back in 2007. 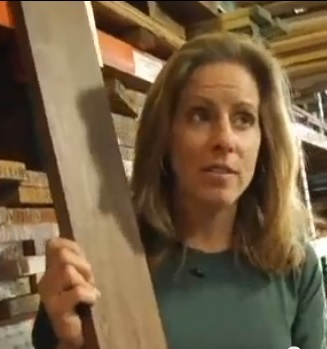 While this show is no longer in production (like many cable/public television woodworking shows), it still got me interested in Gail’s story as a Woodworker. Currently, Gail works in the Cape Cod area of Massachusetts as a Cabinetmaker and Designer, specializing in Kitchens, and her story of finding her profession is a pretty interesting one. She had just moved into a new home with her husband and three kids. They began renovations on the house and by the time they were done they didn’t have any money to spend on actual furniture, so she turned to woodworking and crafted her own (with the help of her brothers in the beginning). I have noticed that this seems to be the way a lot of people find their interest in woodworking, and what better way to learn than building all of your own furniture? After discovering her talents as a woodworker she went to work for Timberwolf Woodworking in order to hone her woodworking skills. After a year and a half she decided it was time to open her own cabinetmaking business, Hometown Woodworking, where she solely ran all aspects of consulting, construction, and even cleaning up the space. Due to the rough economy, she realized she needed to work with bigger firms and had several positions before settling with Cape Kitchens, doing kitchen design and project management. She still maintains her Hometown Woodworking site (www.hometownwoodworking.com) if anybody in the Eastern Massachusetts area is interested in checking out her designs and maybe even contracting her for your next kitchen! A new PBS Woodworking show! Gail is my hero! She was one of the people who encouraged me to get out of just working the shop and think about woodworking education. Through the (Nearly 10 years) we have known eachother, she has eagerly shared her knowledge and has been a great sounding board for ideas. I wrote this article about her as I approached my thousandth blog post. I only hope it does her justice!